In 2008 (before Angel List) there were roughly 1000 technology startups in India starting each year. of these about 50+ got funded by VC each year according to Thomson Reuters. The percentage of services (consulting, IT enabled services, BPO, outsourcing) companies was about 29% – those that started and 33% of those that got funded. The number of eCommerce companies was about 3% of the total. 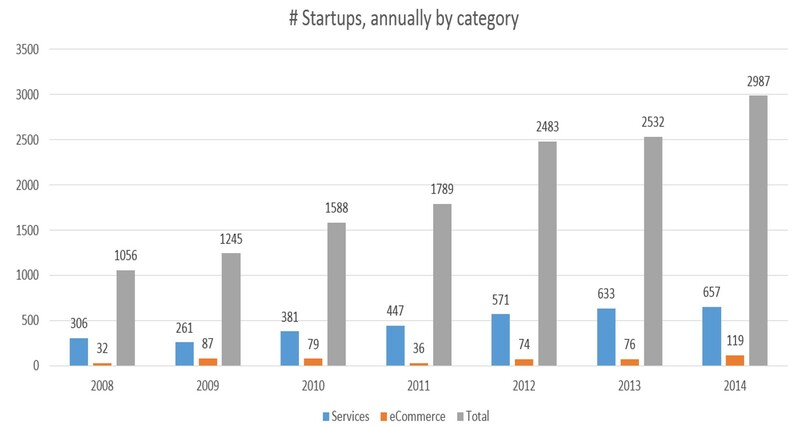 Fast forward to 2014 and those number of companies starting at 22% of the total for services and 5% of the total for eCommerce. The structural changes of the services companies have changed as well. We have gone from 8% of the companies in IT Services to 5% from 2008 to 2014. While Thomson Reuters does not break out the data, anecdotal evidence suggest that there are a lot more digital marketing & design outsourcing companies now than before. The number of eCommerce companies has been steadily increasing as a % of companies started, but has increased significantly as a % of funded companies and a % of total funding. The only other category, which has grown (for which I dont have a breakout again) is software as a service (SaaS). Over the last 7 years, the number of Micro Venture Capital firms has also grown. We have gone from none in 2008 to 5 in 2014, and I think we will end up at about 10 Micro Venture Capital firms (those that have less than $25 Million in capital to invest) in 2015. These include Angel Prime, Oris, India Innovation Fund, Blume Ventures, and others. I have talked to about 5-10 angel investors and industry veterans who are all looking to start their own Micro VC, seed fund and combination accelerator or incubator in India over the last 3-4 months. In 2008, the average amount of time it took to raise a fund (regardless of size) was about 9 – 12 months. That number is lower for Micro VC funds, obviously, but we have no way to know how long it would have taken. In 2011 of the 3 funds that raised, the average was about 7 months. This year, I am hearing funds that are < $25 Million close their raise in less than 4 months. That means the time taken to raise their fund has dropped. It is easier for fund managers to raise their capital, they can do it in shorter periods of time and they can raise more than they initially desired. The challenge for the fund managers seems to be no longer raising capital, but efficiently deploying it. The gold standard for VC investing has been proprietary deal flow (startups that come to the investor for funding exclusively and go to no other investors). That’s becoming harder for all VC’s now. 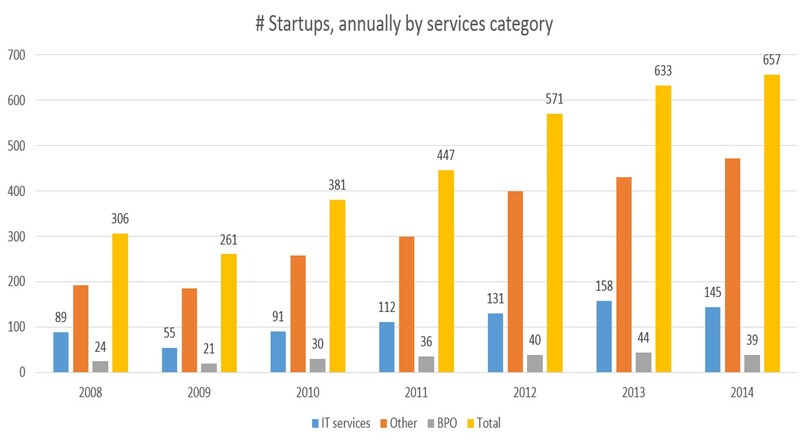 If the number of companies starting up has grown significantly (as from the graph above) and the % of non services companies have grown as well, then there is a real democratization of founding startups. So the problem has now moved to sourcing, building a brand for your Micro VC firm and convincing entrepreneurs that you are the “smartest” capital available. The best entrepreneurs have multiple sources of funding, and they have many investors of different type chasing them. The challenge for Micro Venture firms with no brand visibility or “magnet” founders is that their deal flow is largely limited. From our own data, I can confidently tell you the “best” deals are usually referrals, but 3 in every 5 companies we get into our program are non referrals. Speaking to Accel and Helion last week, I confirmed that 25% of their funded opportunities were cold (unsolicited). So while the Micro VC fund manager may have a decent network, their biggest challenge is going to be that they will not be able to attract at least a quarter of deals which come because of having a good brand in the startup ecosystem. The problem for a lot of the Micro VC’s is going to be that they have poor quality deal flow or deal flow that’s not proprietary. While they will still go to many events, and review Angel List startups, I suspect they will have a tougher time getting good quality companies to apply. The bottom line is that now it is as hard for the investors to get good companies as it is for the entrepreneurs to get good investors.